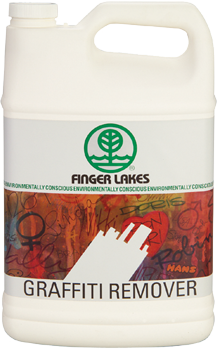 Finger Lakes Graffiti Remover is formulated with terpene bases that are approved under EPA’s SNAP (Significant New Alternative Program), for replacement of ozone depleting chemicals. Graffiti Remover™ is biodegradable, phosphate free, non-caustic, non-corrosive and has low toxicity. Flash point of over 200°F, Tag Closed Cup EPA Method (#SW846-1010). Because of the aggressive nature of Graffiti Remover, it is recommended that Teflon or Buna S Packaging and washers be used in sprayers and pumps. 1. Consult instructions on packaging for various uses.